In the Visitor Centre, a young woman offered me a brochure on the area’s attractions, one being the Durie Hill Elevator. 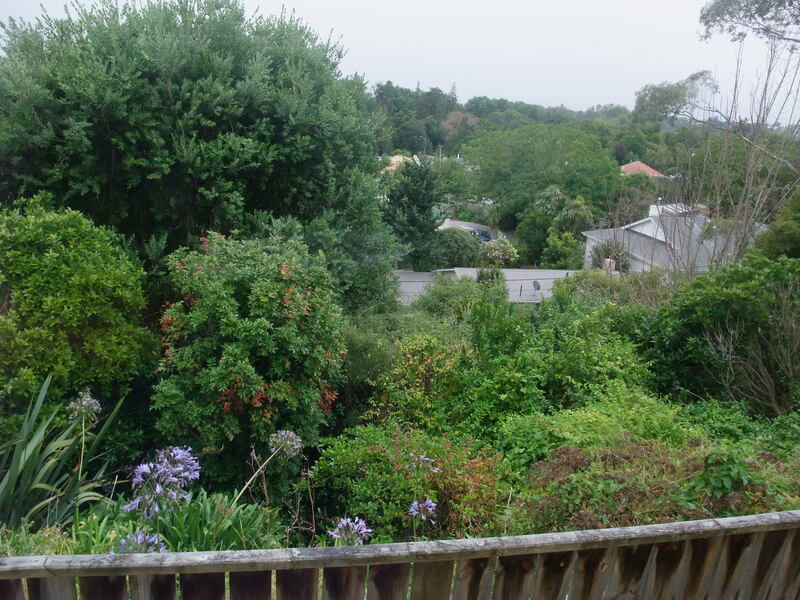 In 1910, the Whanganui Borough solved the problem of providing public transport for the residents of Durie Hill, a suburb overlooking the town, by constructing a lift up through the hill itself. The locals have been using it ever since as a short cut down to the town. I just had to have a look. I wasn’t too keen, once I realised the tunnel to the elevator was 205 metres long and I couldn’t see the end. Still, I ventured into the gloom, intrepid traveller that I am. I felt a bit like a mole, going home after a day of foraging. 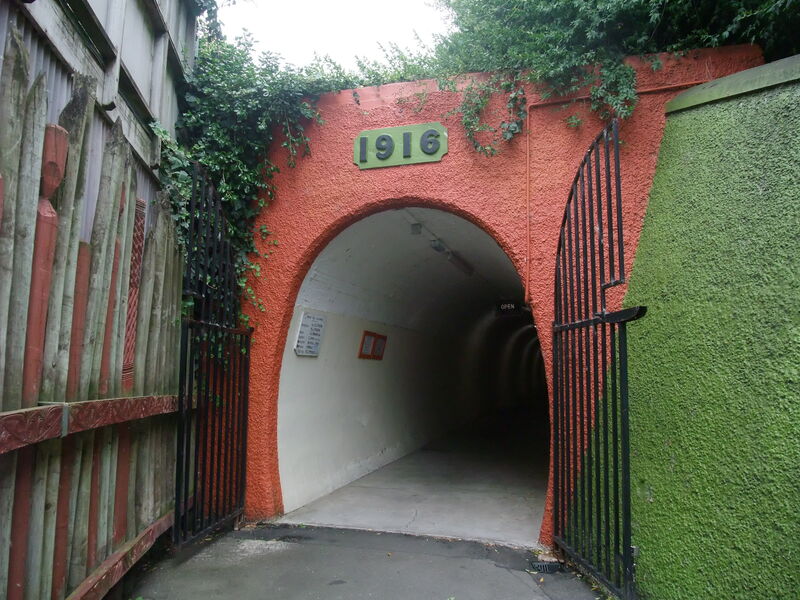 The tunnel ended at a green door, locked and forbidding. 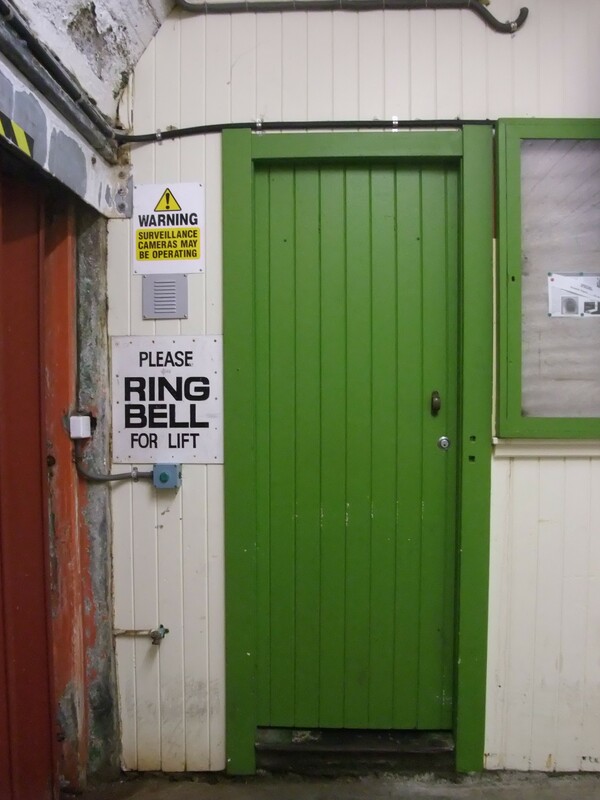 On the wall was a sign, Please Ring Bell for Lift. 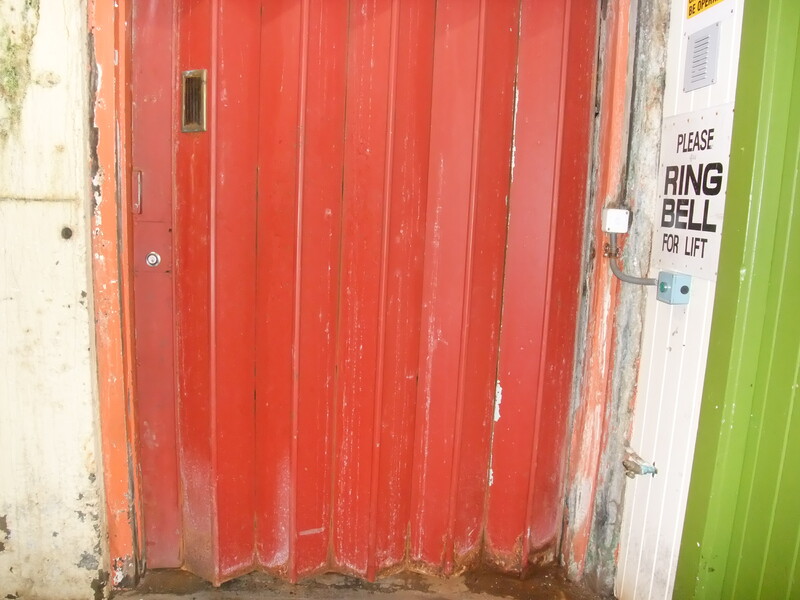 A button beneath the sign was attached to a wire, running up the wall beside a folding door, its red paint peeling and the bottom of its panels corroded with rust. It all looked a bit strange, but I pushed the button anyway. The door wobbled, and rattling, squeaks and an ominous rumble issued from behind it. I waited while the sounds got louder and louder and with a whoosh the door folded back. To my relief, a woman ushered me in (I had no wish to operate this monster on my own) and pulled the door shut. She pulled a lever and the lift worked its way up through the hill. 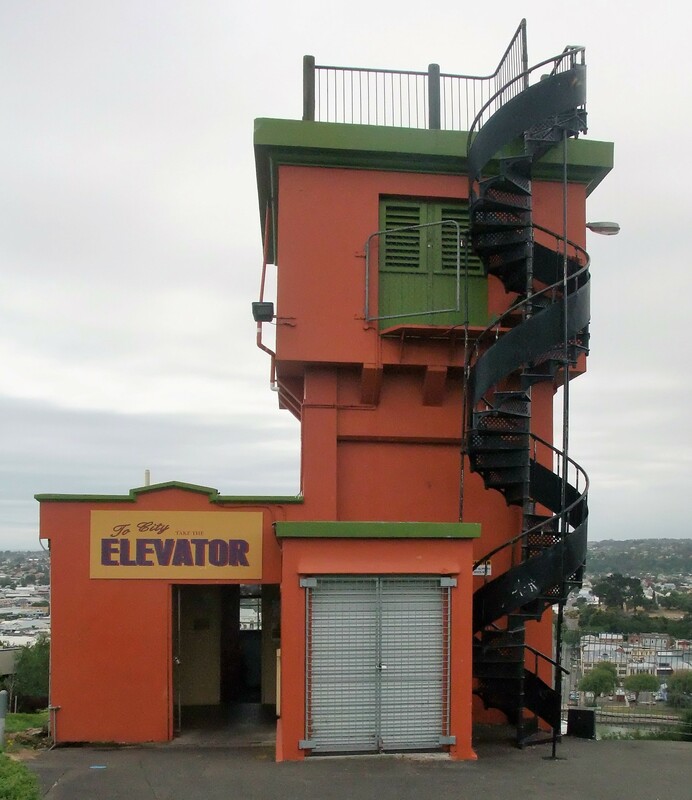 At the top, an orange tower sits over the elevator shaft, with iron steps encircling it, leading to a lookout. There was no way I could go up there. The wind was so strong, I would have been at risk of being picked up and deposited in the winding Whanganui River below. 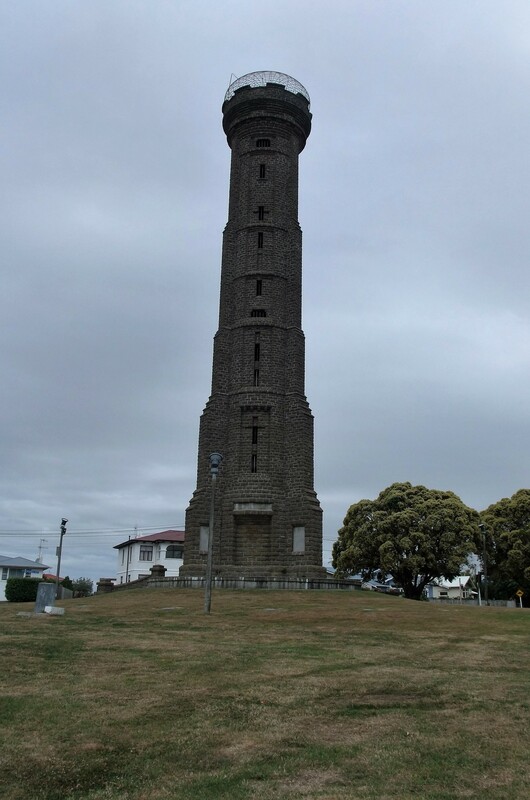 I turned to see a stone tower reaching for the sky, narrow windows climbing to its pinnacle, 33 metres above the ground. It was erected to the memory of members of the armed services from the district, who fell in the first world war. I wandered around the streets for awhile, wondering if the occupants ever get used to the wind. Carried back to the lift, I sat on a bench and looked towards a bridge crossing the river at a bend, and across the township to dark blue mountains in the distance. Music drifted up from somewhere, enticing me to a little pathway down the hill through bush and terraced gardens. I was puffing by the time I got to the bottom and I could understand why they built the elevator. 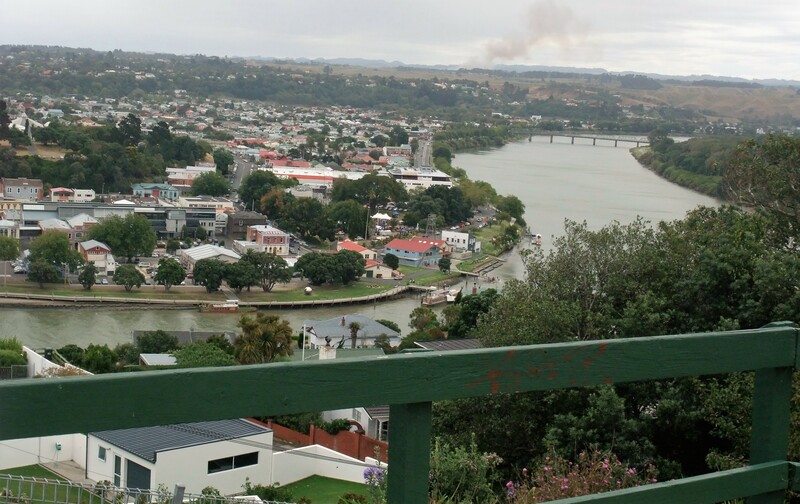 I wish I’d taken more photos of Whanganui. 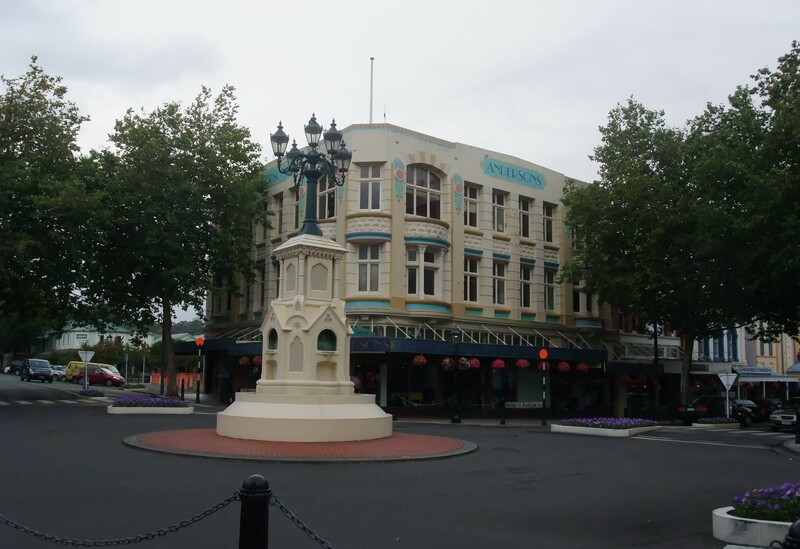 It’s such a pretty place and I recommend it for an overnight stay, or longer, on the way to or from Wellington. Well done for tackling the tunnel. Think I would’ve found that a bit off putting as well. Thanks, Tracey. It did feel a bit intimidating at the time because there was no-one else around. Actually, the lift felt more intimidating. I’m not sure how often they service it but it was a rough ride. Cheers. How fascinating, the quirky things that you can find around. Really interesting. There is a similar tunnel and elevator up to Santa Barbara Castle in Alicante and I have taken it a couple of times. It is a bit weird but worth it when you get there. I have heard the elevator has stopped a couple of times with people in it and it took a while to get it going again. That would have been scary. Your pictures are great! Thanks for that, Darlene. I’ d like to track that down some day. I wouldn’t be nervous next time, I’m sure. Well, I would if it stopped half way. Very cool that the elevator has been around for that long. I can see how the experience would be a little stressful…fun colours though. Thanks, Caroline. I was a bit worried about the rust. I love that! Really quirky. Thanks, Anabel. I’ve been enjoying following you around the Scottish islands. In earlier days, I walked steel beams high in the air and even now don’t mind heights or many other things. But I would have hesitated both at the tunnel and lift. Good for you. Thanks, Ray. I was just being a bit neurotic, I think. It’s a weird thing what we’re frightened of. I have the most dreadful trouble with heights but I can go deep into a cave without the slightest problem. Cheers. ooooo – I love that spiral staircase leading up from the elevator. I do have a thing for following staircases! I know what you mean though about winds. Several weeks ago I climbed a lookout tower on a windy day and had the same thoughts about getting blown away. In spite of the cold, I took off my hat for fear I would lose it.